In Illinois we have two state fairs ... one in our capitol Springfield and a second one in Southern Illinois called the DuQuoin Stere Fair. This year, my daughter Nicole and I attended the Springfield State Fair to accept an award from State Comptroller Judy Baar Topinka. She recognized folks who have worked in agritourism and our culinary destination project was a winner! It's hard to take a serious picture with Ms. Topinka ... she's a blast and we all love her for her efforts ... and her sense of humor! Just look at our picture in the sidebar! We'll attend the DuQuoin State Fair, too ... for several events including a Willie Nelson concert! 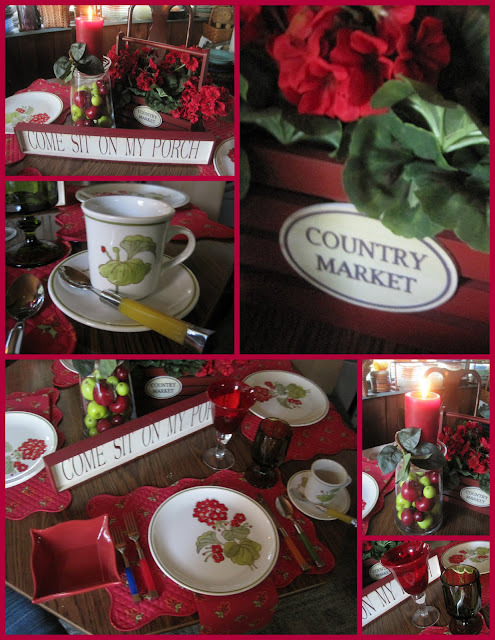 Here's a cute tablescape I set to celebrate state fair time! 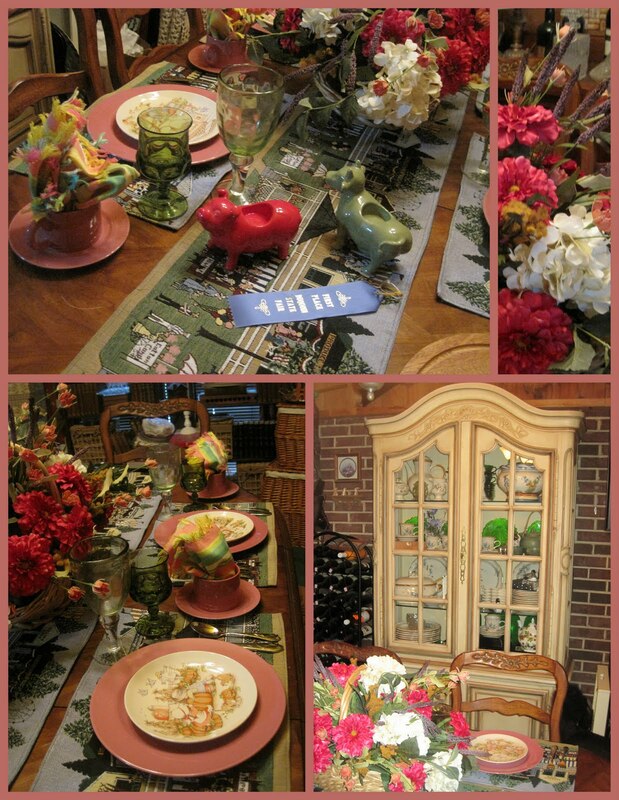 The whole table theme focused on a set of place mats and a table runner that I have used for 15 years! I get them out at least once a year! Look closely at these cuties .. all the elements of a perfect fair! I wanted the centerpiece to pick up the colors in the placemats ... especially the cluster of balloons, so pink was a must! 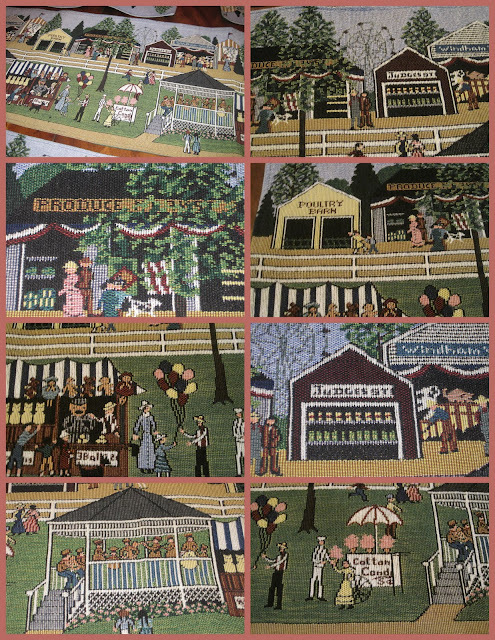 I surrounded the silk flower basket with other key elements of the fair ... the animals ... and the only blue ribbon I've ever won at the state fair! It was for a centerpiece that had a ceramic pig in it! 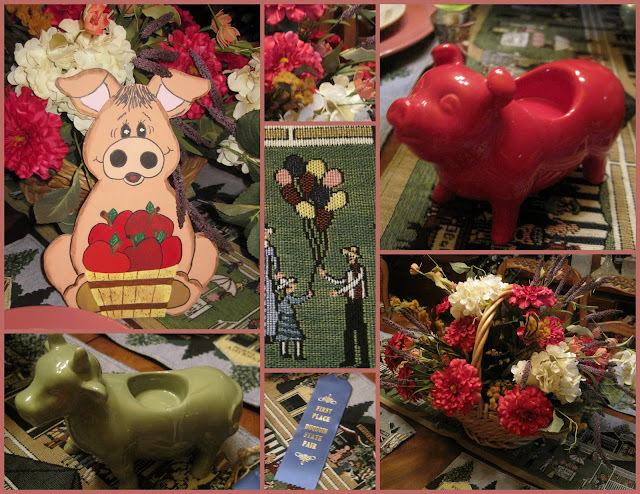 My sister made me the cut out pig with her basket of apples .. .several years ago .. .but she finds her way to many tablescapes! 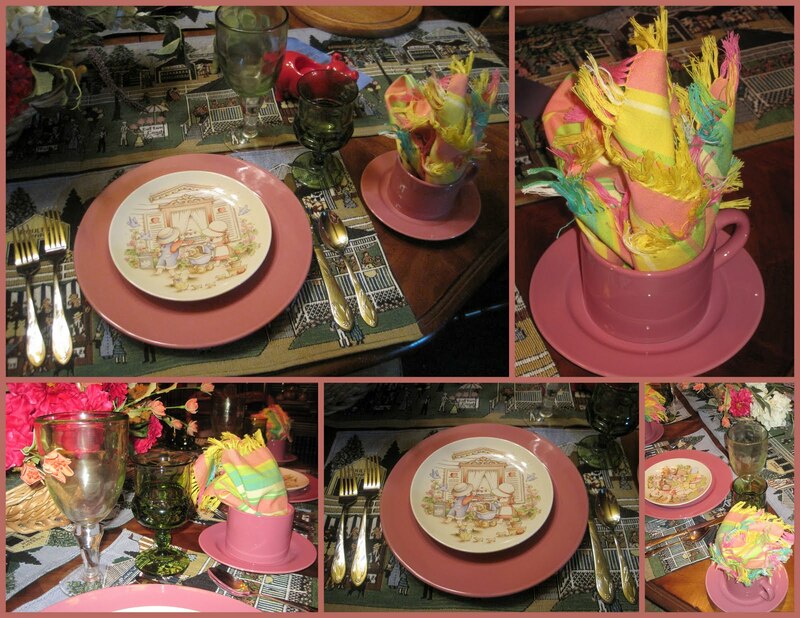 My dinnerware ... and especially the napkin .. mimic the fair foods ... pink cotton candy and lemon shake-ups! I don't eat cotton candy anymore, but still have at least one shake-up ... then I'm on a sugar high for three days! The dinnerware is Home Trends from JCPenny. Now for the stars of the tablescape ... and of the state fairs in the Midwest ... Watkins, the extracts and seasonings folks ... and now they sell all kinds of cosmetic products, too! I have a collection of Watkins Kids plates ... and they are adorable. You'll see more of them this year at Halloween time .. but for now, take a look at these sweet little salad/dessert plates. They were made in 1991 ... and I love to use them! Make sure you click through to see all the other posts ... and if you'd like to see the dinner we had on this tablescape, click my homepage and visit my other posts! One of our favorite meals includes a big thick sirloin steak marinated in one of a few combinations of flavors, then grilled and sliced thinly, served with a great sauce! The men in my life think you can't have steak without potatoes ... and then there's the bread ... must have bread ... and we all love Caesar Salad and Roasted Broccoli! Add a steaming cup of coffee and biscotti to dip and swirl, and we are happy folks! This meal had a little Spanish flavor. The marinade for the meat was 1/2 cup each of red wine, olive oil and water ... with a Tablespoon of fresh lime juice, a little garlic and fresh cilantro. Mix it all together and let the steak soak in it for 4 hours at room temperature, turning it frequently. Grill it your way! I also made a sauce by reducing the marinade to about half and adding approximately a cup of chipotle BBQ sauce and a cup of beef stock ... and simmered mushrooms in it. I made the au'gratin potatoes with cream and Chihuahua cheese and rolled the pull apart bread chunks in chopped fresh cilantro and chives. I posted this a couple months ago for Pink Saturday, but wanted to post it again for Thrifty Things Friday because I've managed to buy 6 of these adorable strawberry bowls ... thrifting! They actually are the center piece to a Lazy Susan style crudite tray ... but I keep finding the bowls without the rest of the pieces. They are perfect to start a meal with ... a neat covered salad. Everything else in that stack came from junk stores, too! We enjoyed a vacation in the Wisconsin Dells ... at the Kalahari Waterpark Resort! What a place! The first night, as we started to have dinner ... the restaurant hosted a dance contest! 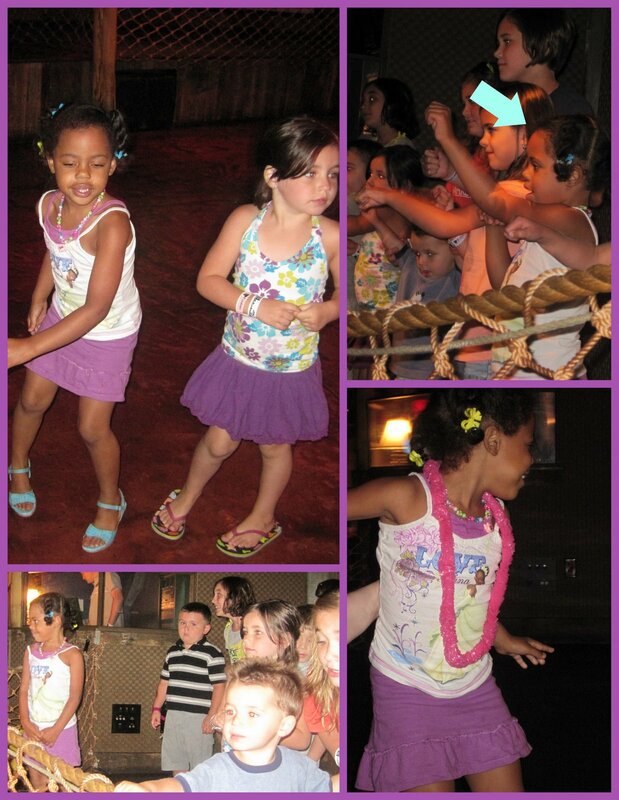 Miss Phoebe and this other little girl in purple ... rushed to the dance floor. Then the kids all went to the stage and learned a dance routine to "Wooly Bully"! Now, you have to be a grandmother to even remember the song "Wooly Bully" ... but the kids didn't care ... they had a great time and they all won a lei! 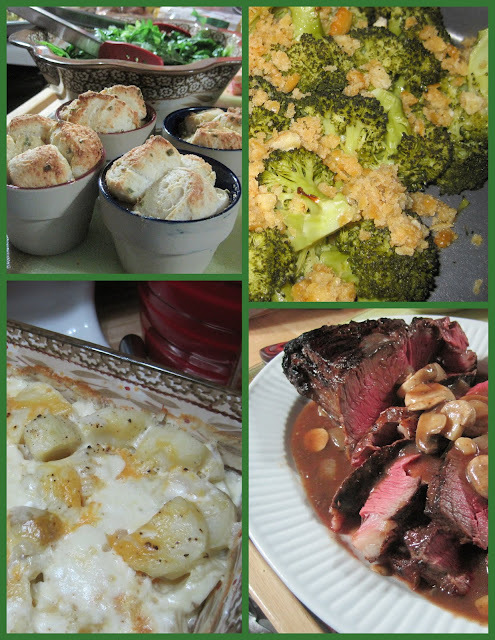 I'm joining On the Menu Monday so make sure you click through to visit all the other posts. Thanks to our hostess at Stone Gable. Mix together 2 cups flour, 1 ½ cups sugar, 1 teaspoon baking soda, ½ teaspoon baking powder, ½ teaspoon cinnamon, ½ teaspoon powdered ginger and ½ teaspoon salt. Whisk together 2 eggs and 1/3 cup canola oil. Gently blend the wet ingredients into the dry ingredients. Don't over mix. Stir in 2 mashed ripe bananas and 2 peaches, peeled and chopped. Bake in 2 prepared bread pans for 45 minutes at 350 degrees. You can top the bread with chopped nuts and/or cinnamon and sugar before baking. Cool about 15 minutes before inverting from the bread pans. This cute summertime decor began with a gift from my brother and sister-in-law ... this cute wall hanging that is a window frame with chicken wire in place of the glass! I loved the red geraniums ... and we all love our 'blooms' and our 'grand-blooms' ... so the sentiment was so sweet! I decided to hang it on the brick wall of my sunroom. Then, I got this cute 'sit' sign in the mail from my sister ... on her birthday ... she sent me a gift! She bought it for my front porch after seeing my new red cushions. If you missed that post click here to see it! 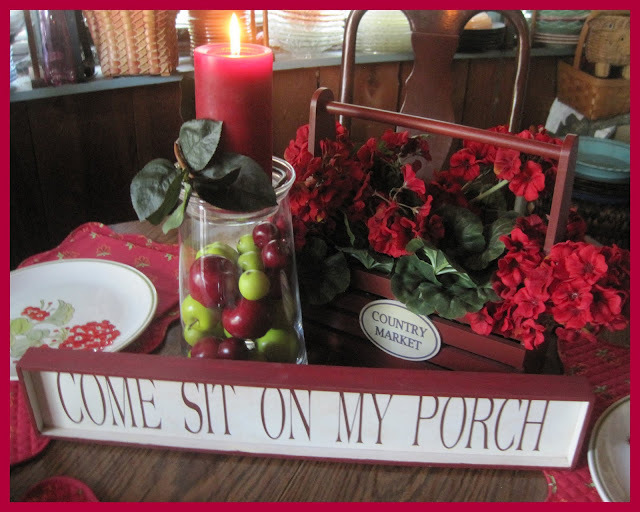 So, the sign found its way to the back porch sunroom! 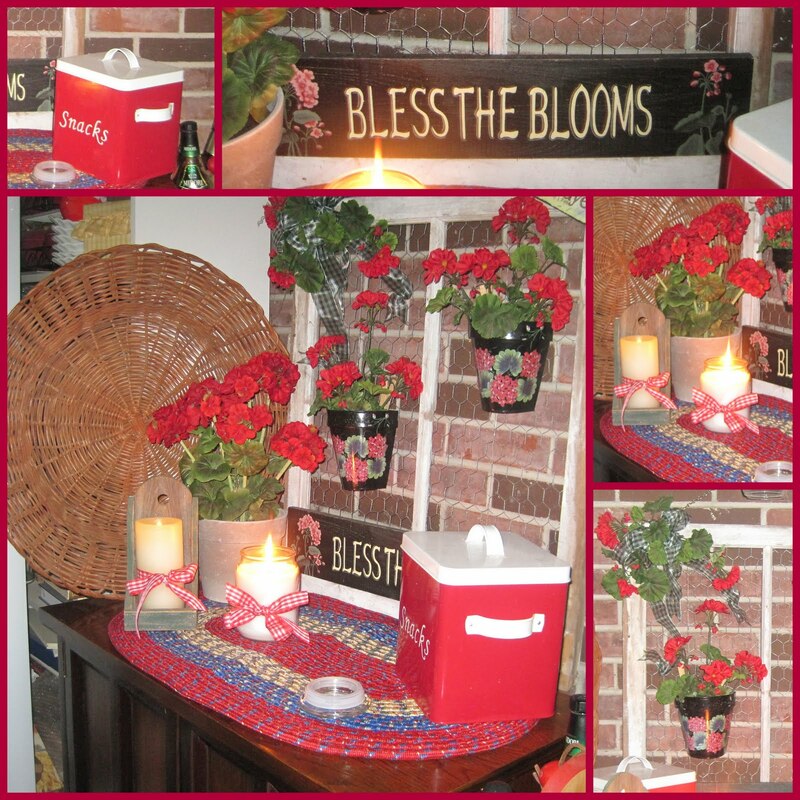 I love the pots of geraniums ... and have it hanging over the liquor cabinet. It was easy to find lots of things in the house to move to the sunroom ... and red gingham checked ribbon around the candles was a must! 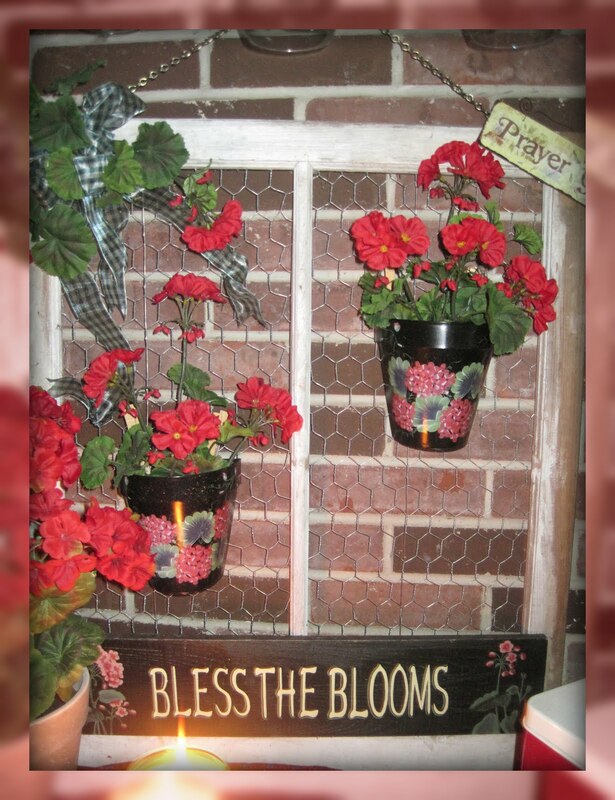 A candle jar filled with faux apples and an apple scented candle loves it place beside the red tool box filled with more silk geraniums. 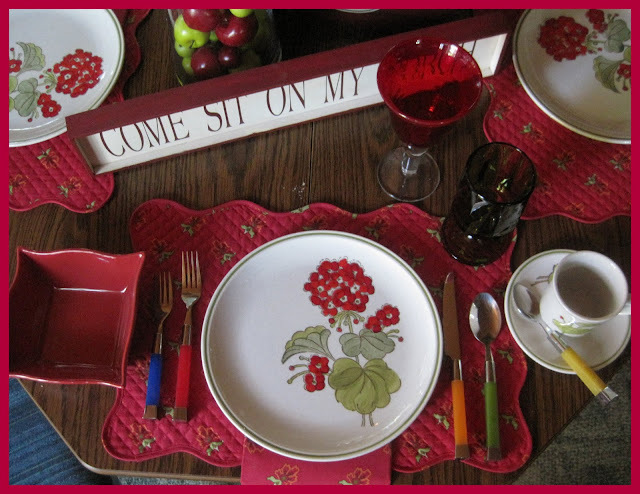 ...and didn't you know I'd have red geranium dinnerware to complete the scene? 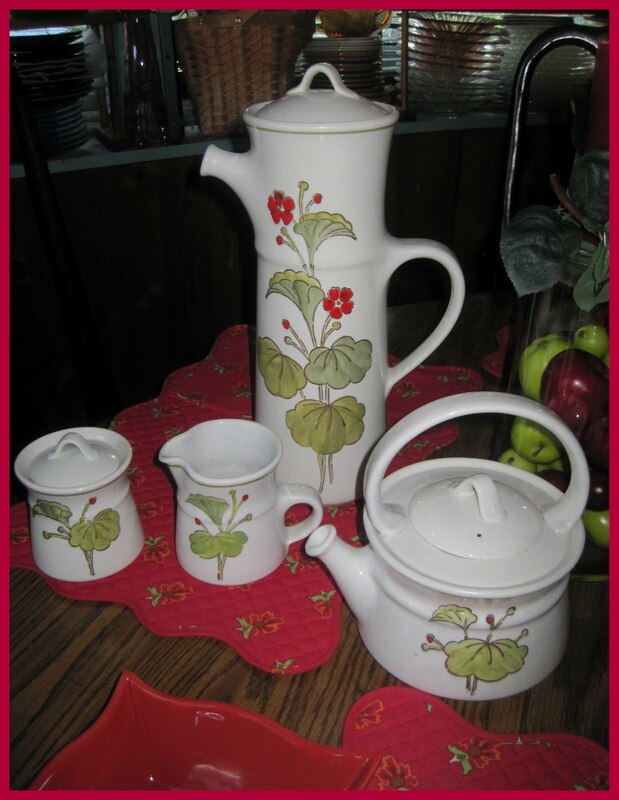 The dinnerware is Metlox pottery, made in California ... probably from the late 70s. 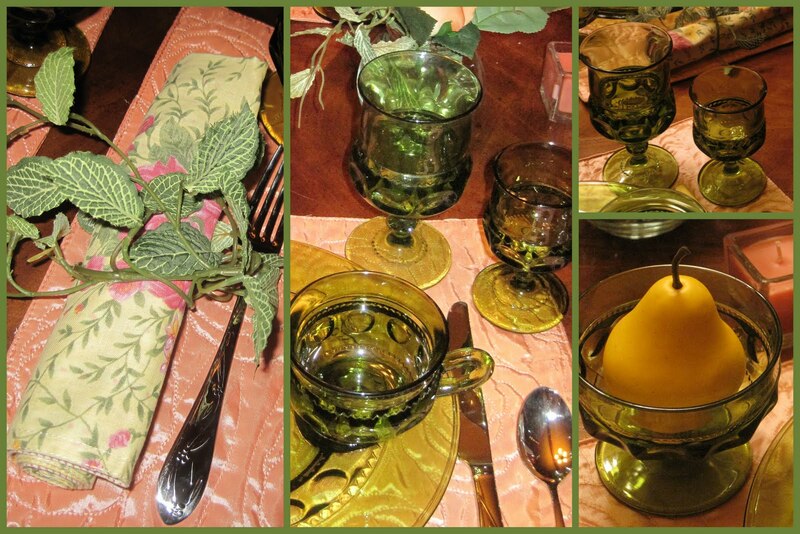 The square bowls are Pfaltzgraff and the linens are Tina Vasi from Dillards. Who wouldn't love the adorable coffee and tea pots? The shapes are so unique and the geraniums are so detailed! 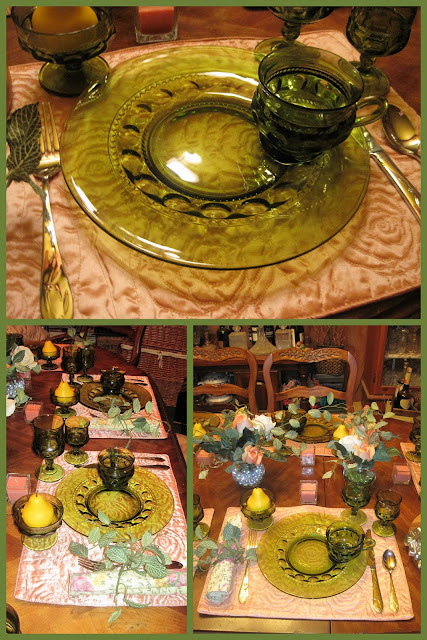 Hope you enjoyed one of what will be among the last bright summertime tablescapes! It's almost time for pumpkins and fall foliage! I'm linking with a couple parties so make sure you click through to see the other posts. 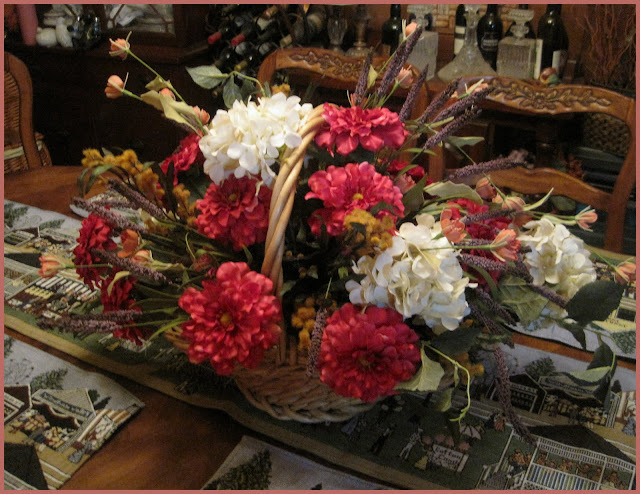 Hope you enjoyed ... and hope you visit my home page to see my other posts! 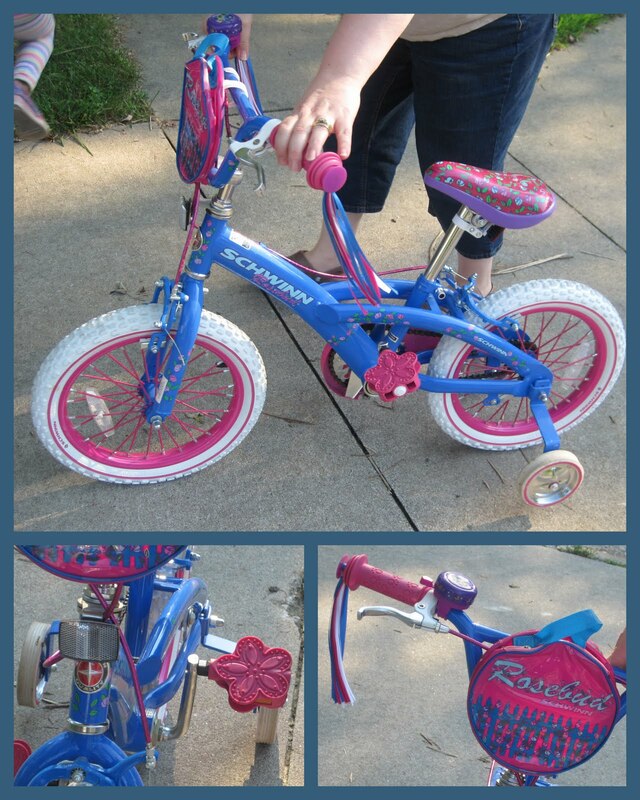 Miss Phoebe has a new blue bike and the pictures are, of course, adorable! Phoebe Got Her First Bicycle! My grandbaby, Phoebe, got her first bicycle today and we sure did have lots of fun! Here she is with her mama trying to keep up with her ... and keep her out of the mud that the city sewer workers left behind a couple weeks ago! Now, it is important to know that this first bike had to be blue ... her favorite color! Her Grandpa said it had to be a Schwinn ... and I said it had to have a bell, tassels and a basket ... although they put these cute little satchels on them these days! A trip to to the toy store ... and we found the bike that met all the criteria! It is called "Rosebud" ... and look at the cute flower shaped pedals! We found a blue helmet ... that she calls a "helmote" ... with the Princesses on it ... and flashing lights, too! I got knee pads and elbow pads, which she'll probably never wear again ... but the "racing gloves" were a big hit! So, while her daddy put some extra air in the tires, she got all dressed and appeared in full regalia! 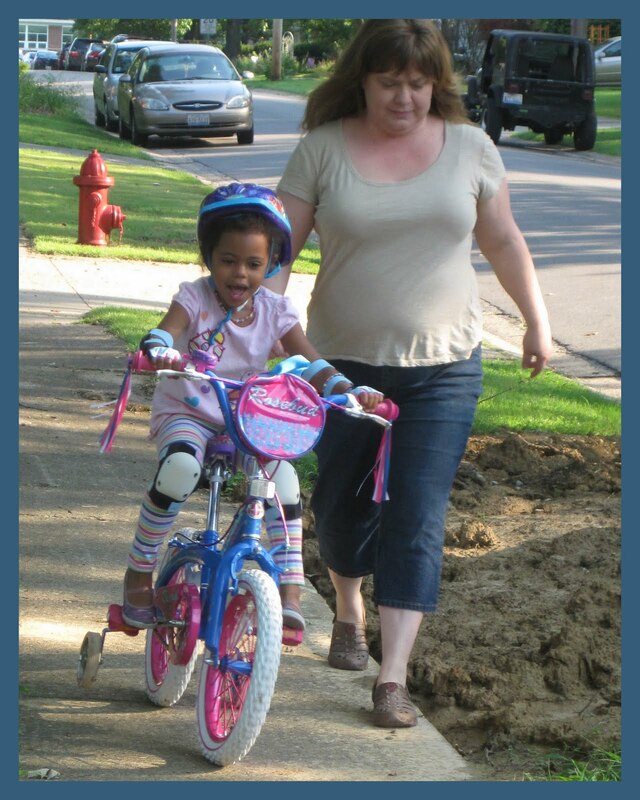 She got on it and tested it a little ... then they moved to the sidewalk in front of their house ... where she will only be allowed to ride with a parent! As her daddy brought her back downhill, she had to stop ... get off ... and pet the neighbor's dog that was being walked! We couldn't believe that ... although I don't know why ... she is a dog lover! How do you like those striped leggings? Everything must match, you know! Another memory made! Hope you enjoyed sharing this little event with us! Heart of the Home Chickens & Roosters! It is time for a party! I'm happy to be participating in the Heart of the Home Party at Note Songs. Make sure you click through to visit the other posts and say a big thank you to our hostess! 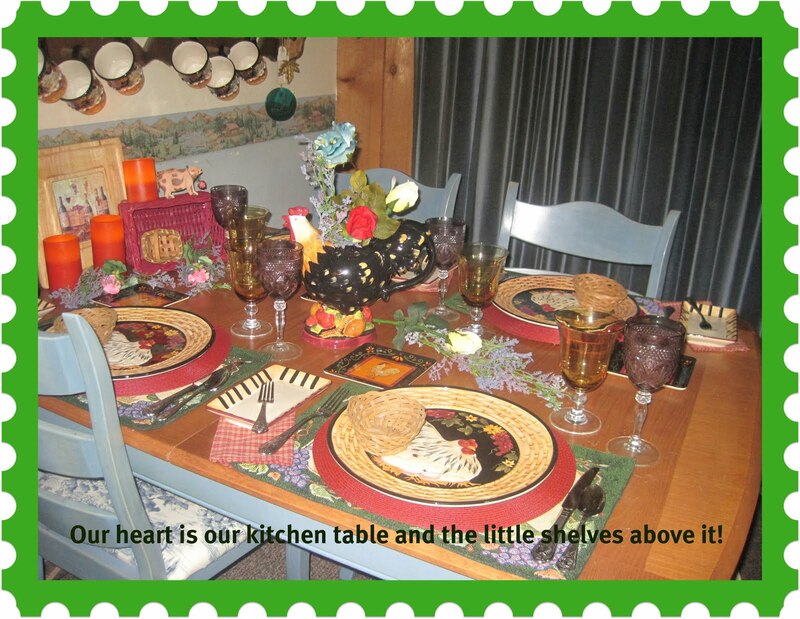 The heart of our home has always been the kitchen table and the little shelves that hang above it! I've recently switched some furniture around, but it doesn't change anything! 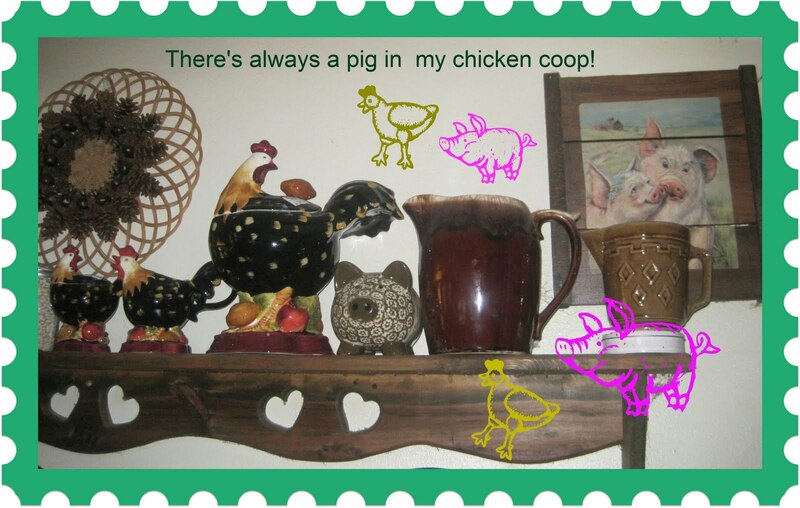 It is still the table in the kitchen where everything happens ... including parties with chickens and roosters ... oh, and always a pig or two! 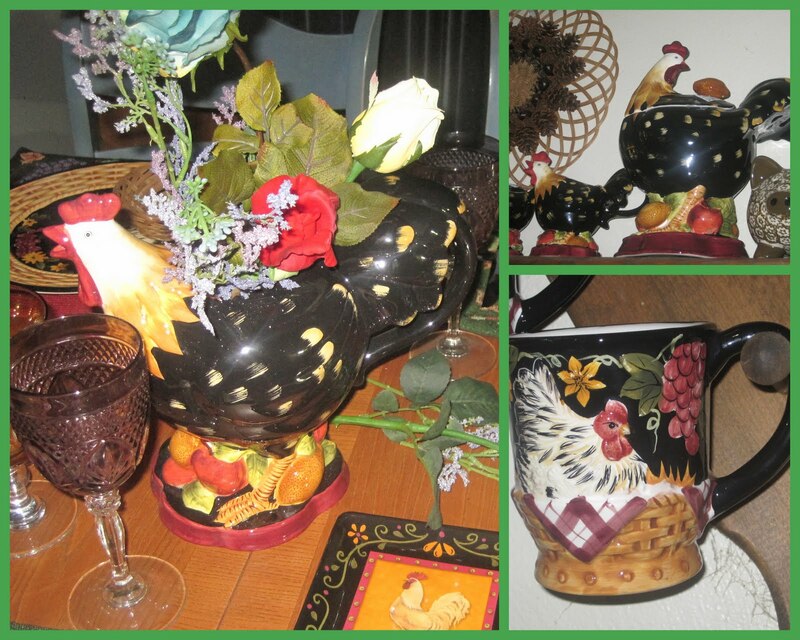 This cute chicken/rooster tablescape began with a woven place mat ... that also depicted grapes! We're all about local wines, so it is an important part of my decor ... always! Then came a burgundy round mat on top of that cutie. 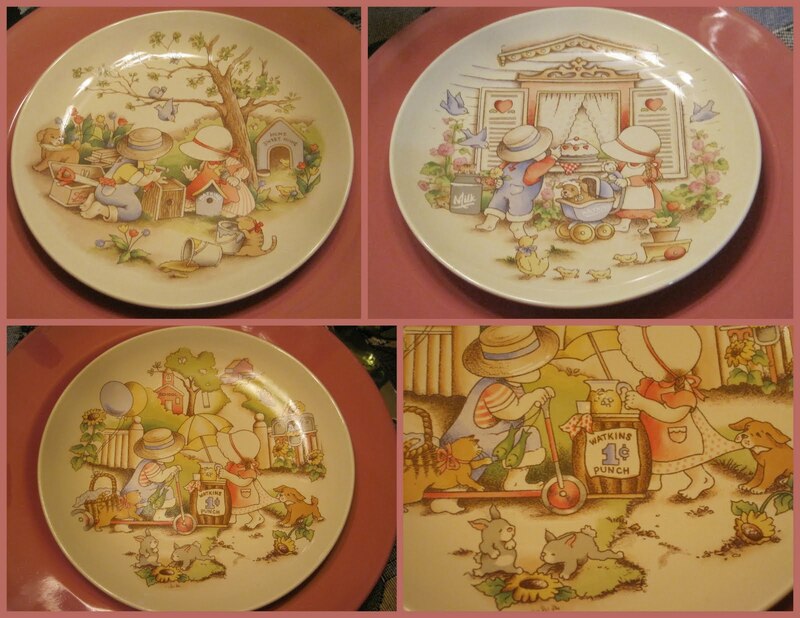 Then a beautiful over-sized plate that has a raised design on it. I added little baked potato baskets that I have had for 35 years! It used to be popular to serve your baked potato, wrapped in foil, placed in those little baskets. Sometimes I still do that! 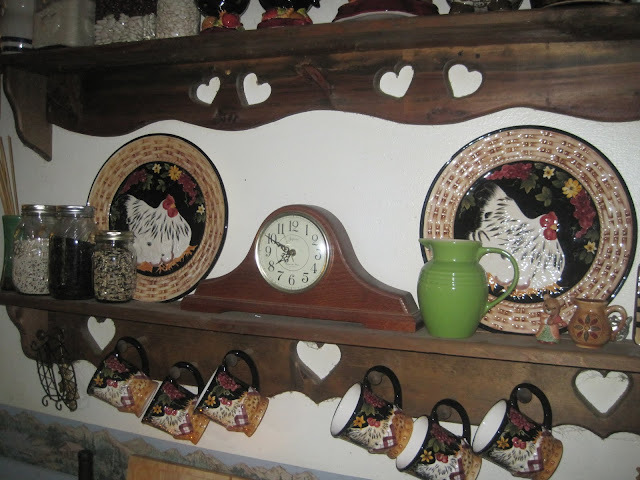 I used these cute rectangular plates as side salad plates; the square appetizer plates as bread and butter plates ... and everybody always loves my Cambridge flatware flaunting those proud roosters! I loved the mugs that came with this dinnerware ... which was a summer discounted batch from Old Time Pottery. 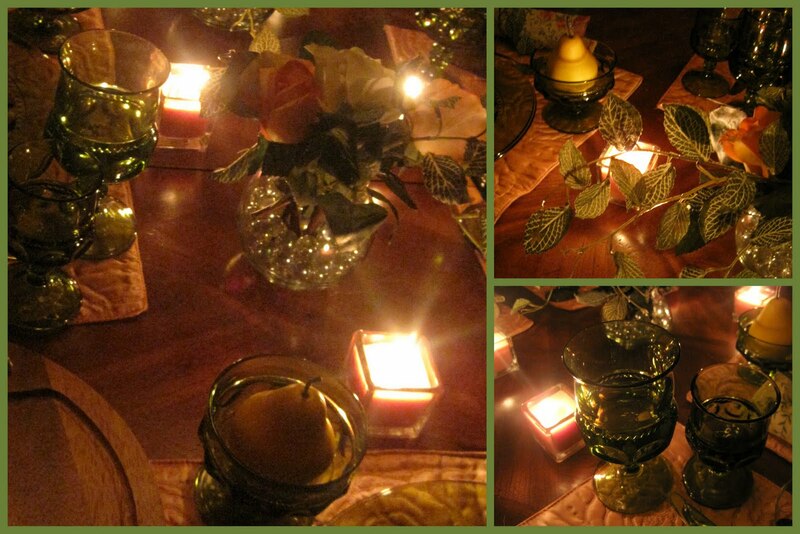 I used the pitcher for a bit of a centerpiece ... used purple and amber glasses with this setting ... and enjoyed a meal of baked chicken breasts, spinach salad, homemade rolls with herb butter ... and a baked potato! Cockadoodle doo! Hey! 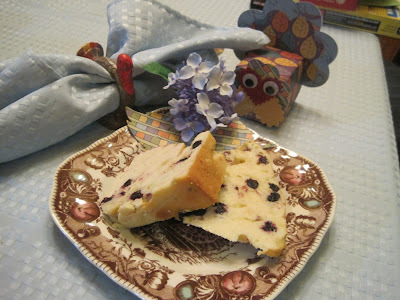 I'm reposting my recipe for Lemon Blueberry Quick Bread from last Thanksgiving ... I used dried blueberries, but cranberries, raisins, ... any dried fruit would work fine. I'm linking to Sunday Favorites so don't forget to click through to see all the other partiers! Thanks to our hostess! 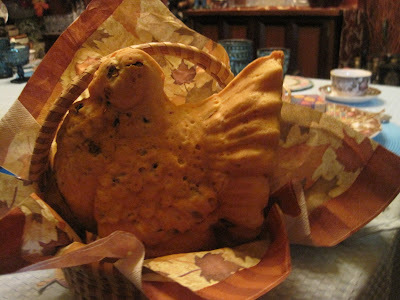 I baked this cute loaf of bread to snack on the day after thanksgiving ... when we have Turkey Ala King! I adjusted the recipe on the package of the Nordicware Turkey pan and have included it in this post. I used blueberries that I dried last summer instead of dried cranberries, too! Yummy! Whip the shortening, cream cheese, sugar, eggs, lemon juice and extract until creamy. Sift the flour together with the baking powder and salt and add this alternately with the milk and continue whipping until well blended. Fold in the blueberries and bake at 350 degrees for 40 – 50 minutes until a pick inserted in the center comes out clean. Cool on a rack for 10 minutes before inverting the bread. 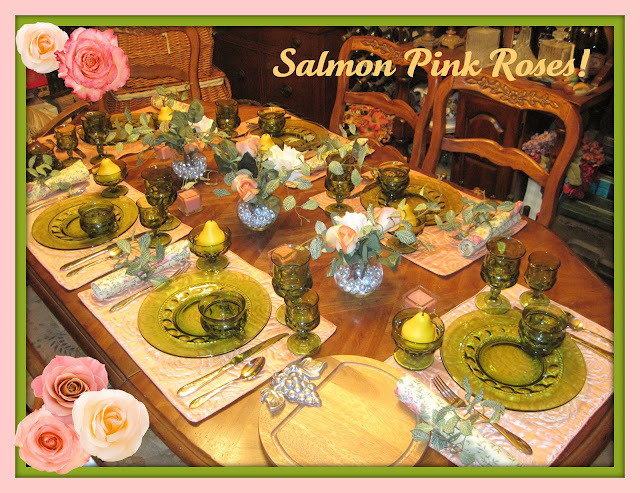 Happy you stopped by to see my pretty salmon pink tablescape! It all began with a TJMaxx purchasse of place mats that were thrift shop priced! 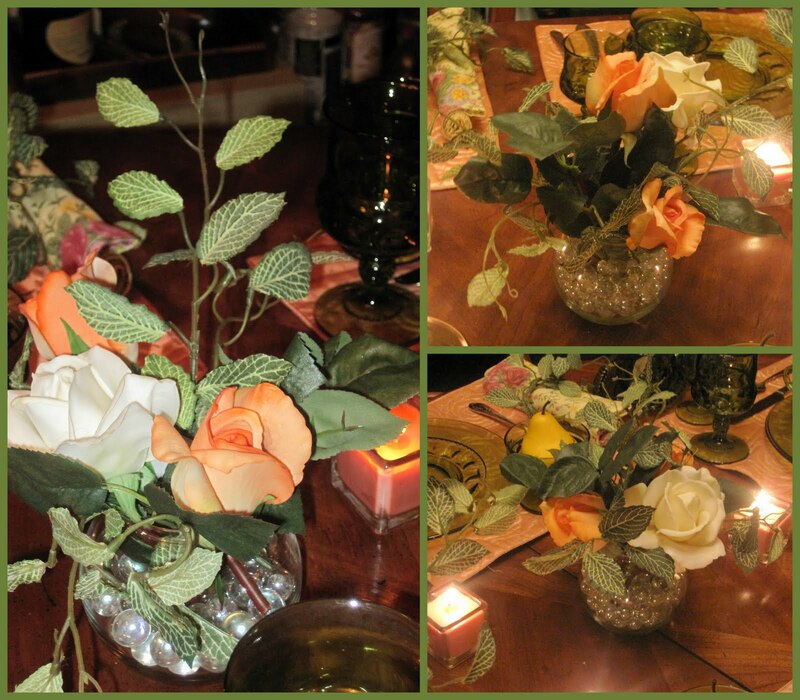 I just happened to have some pretty roses that matched the place mats ... so the fashioning began! This beautiful green dinnerware was chosen by my husband! He first saw it in an antique store and the color, of course, took us back to the 1970s. He said, "buy it." I didn't do it, though! Then I found some more at a real junk store ... the kind where you leave and wash your hands! From then on ... I bought it every time I saw it and finally acquired enough to use for our Autumn Open Houses! It is Kings Crown, made by Indiana Glass, and it comes in 4 different colors. The centerpiece is composed of 3 fish bowls from a yard sale ... filled with clear glass marbles to hold the roses and the silk greenery that also came from a yard sale! I use marbles instead of oasis for faux or real floral arrangements. They hold everything in place beautifully and can be reused. Using colored marbles in clear vases allows you to change colors easily. I used some of the branches of greenery to make napkin rings. 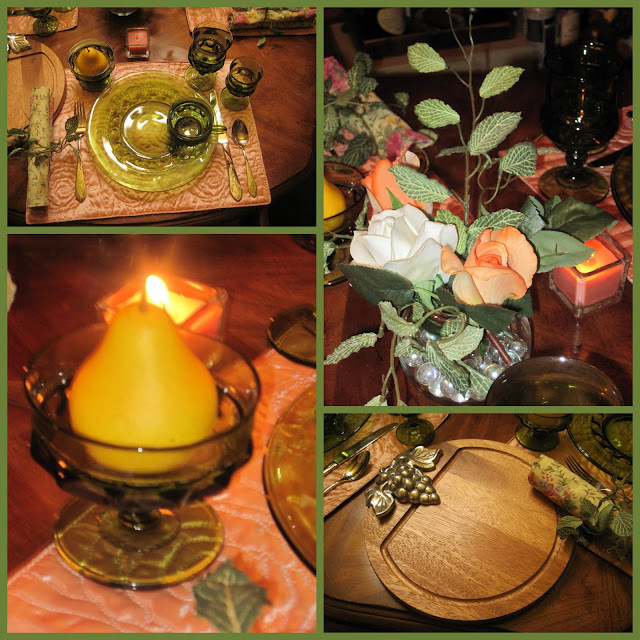 The faux pear in the sherbet dish represents a part of the menu for this meal, which I'll share at the end of my post! Doesn't it always look beautiful in the light of candles? Who can pass up the opportunity to share that? 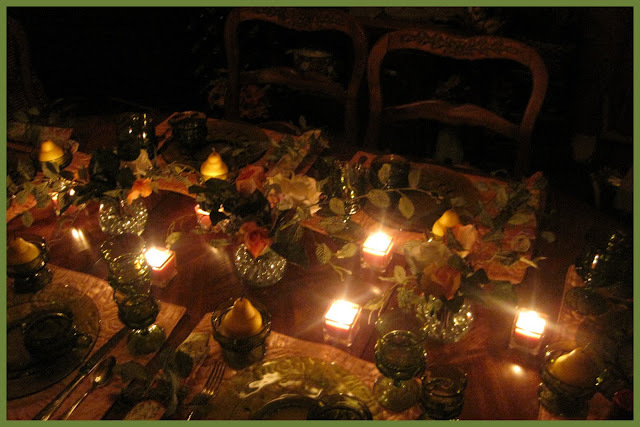 This meal was a luncheon, so the room wasn't this dark, but it was still pretty the night before! The great cheese board embellished with the grapes came from GoodWill for $2. Can you imagine? I have another one similar that I paid $40 for. The menu for this meal followed an orchard theme ... lots of fruit. The orchards in Southern Illinois and Southeast Missouri have wonderful pears, peaches, berries and apples. You might have noticed the bottles of wine ... one of them was local strawberry dessert wine and the other was that cheap Boone's Farm Watermelon Wine! We make an incredible sangria, with the Boone's Farm ... that we chock full of fresh melon balls and we make it even better by adding plenty of Midori, a melon liqueur. Make sure you click through to find all the other posts and leave a thank you message for all the hostesses!